These boots from Högl are made of dark brown leather and I look forward to wearing them again every winter. I feel like I’ve had them for ages but in fact, it’s been less than ten years. That’s actually the beauty of high quality leather items – they acquire a patina and actually get better with age. All you have to do is to keep the leather supple and polish it once in a while. Cable knits are almost as much a part of my regular winter wardrobe as boots. I just love the intricate patterns and texture of aran sweaters and cardigans, especially in light colours. What are your favourite winter items? 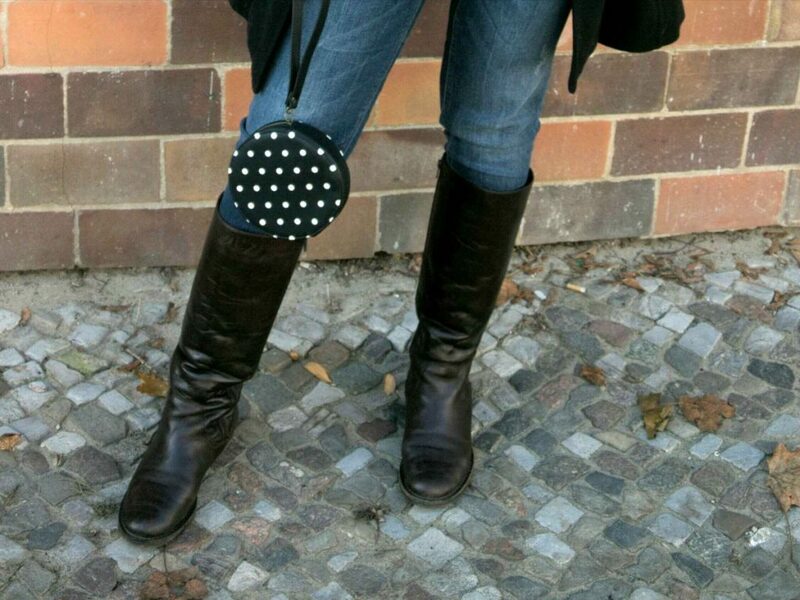 Do you wear boots only in winter or during the transitional period too? I’m looking forward to wearing thinner outfits once the weather gets better. Kinda had enough of sweater days :) I love cable knit sweaters, they look good with jeans. Der Pullover ist ja toll. Ich hoffe jedoch, dass es bald Frühling wird. I love cable knits. I can’t believe winter is coming to an end. Looking forward to your spring looks. Spring is having cold feet here as well, I’m not sure when it will decide to show up….but well what can be done? I’m never sure when I will wear my last Winter outfit. I really like that sweater. Perfect jeans and boots. This is a really sweet casual styling. You look very pretty and chic. Did you dye your hair a shade darker? It looks really shiny and nice. Lovely sweater and cute bag! Such a great post! I am so obsessed with it!!! Ein toller Look! Ich mag die Boots sehr gerne. Ich finde gerade deinen Pulli total schön. So ganz traue ich dem Braten ja noch nicht. Hier gab es zwar schon ein paar schöne und milde Tage, aber nächste Woche soll sogar noch mal Schnee kommen! Ich mag Stiefeletten so gerne, die passen auch noch in die Übergangszeit. Stiefel selbst sind dann schnell einmal zu warm. mein Favorit ist die hübsche und süße Pünktchen-Tasche :-) Das habe ich dir schon in deinem anderen Post geschrieben :-) Das Outfit ist top! So ein ähnliches Outfit habe ich auch öfter im Winter getragen, aber die süße Tasche habe ich nicht. Ich habe eine große Tasche getragen. So eine Art Beutel-Tasche.